What is considered old age for cats? The old classic adage "one human year equals seven cat years" may be an easy way to calculate and relate to your cat's age, but is not entirely accurate. The cat's stages of life—kitten, adolescent, adult, senior—are more accurate of a comparison between humans and cats. In addition to age, there are a number of signs that your cat may be approaching seniorhood. As a rule of thumb, a senior cat is aged 8 to 10 years old or older. It is at this age that you should consider a consultation with your veterinarian to determine the best health care maintenance program for your cat as it ages. Each cat, like each human, is different. You can expect some physical changes as your cat ages. Your cat may not be as active and its once-keen hearing and eyesight may not be as sharp. If you have videos of your spry kitten or young cat from a decade ago, you may notice your kitty has lost some pep in its step. 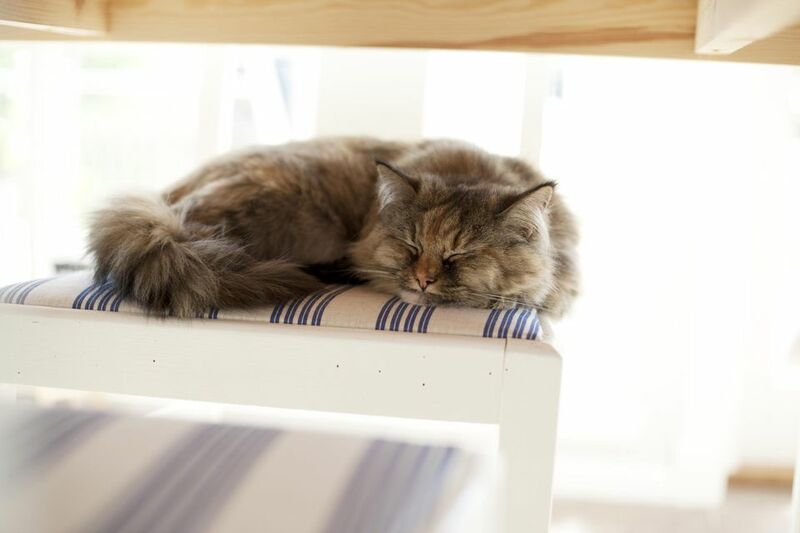 Other signs of slowing down include a cat that takes longer cat naps and may sleep for longer stretches. Old games of "chase the mechanized mouse" or "catch the string" may no longer get your cat moving. You might notice that your cat might not want to climb the cat condo as much. Or, favorite perches up high might no longer be within reach of your cat. You may even notice if your cat has some difficulty going up and down stairs. Just like humans, cats can experience hearing loss. The rate of loss is variable. For some cats, hearing loss may be barely noticeable, or it can be total. Always have your vet examine your cat's ears if there is a question of hearing loss. Your vet should be able to rule out parasites, infection, growths in the canal, or other medical problems that could interfere with normal hearing. Like dogs, cat's eyes often show a bluish transparent haze in the pupil area. This is a normal effect of aging. The medical term for this is lenticular sclerosis. Vision does not appear to be affected. This is not the same as cataracts. Cataracts are white and opaque. Vision can be affected by cataracts, and if your cat's eyes appear whitish, then your vet needs to be consulted. Iris atrophy, or thinning of the iris, may occur in some cats eyes, particularly those with irises lighter in color, like blue-eyed cats. The eye's iris may appear to have splotches, or appear "moth-eaten." Except for in extreme cases, this condition usually does not affect vision. This condition may occur only in one eye and can cause some cats to become more light sensitive. If you notice this condition, you should have it checked with your vet. In some cases, increased pigmentation in the iris may indicate a risk for malignant iris melanoma, a type of cancer, and should be ruled out. Loss of muscle mass, called muscle atrophy, may occur in old age. You may notice this, especially in the hind legs. If your cat is having trouble standing or walking, see your veterinarian. Some cats with diabetes can have nerve problems and lose hind muscle mass or become "dropped in the hocks." As your cat ages, you should go to the veterinarian once a year for a regular checkup. A vet is trained to look for warning signs that you may not notice that can lead to senior cat health issues that are preventable or easy to maintain if caught early. There are a number of senior cat health concerns you should be aware of.